Connecting the interior to the backyard, the south-facing side wall was originally painted the same color as the home’s exterior, creating a seamless indoor/outdoor transition. “…We liked the unbroken, flowing look of a single color extending from inside to out,” Marty shares. 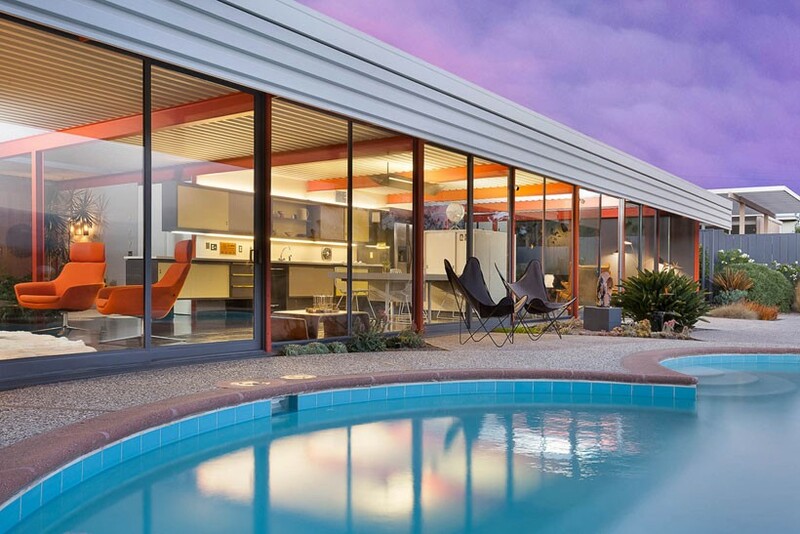 The continuous single-color scheme was kept, but the hue was updated from olive-brown to a warm gray, which extended to the entire exterior of the home. Dark and light copper links form circles on this custom divider which separates the Master bedroom from the living area. 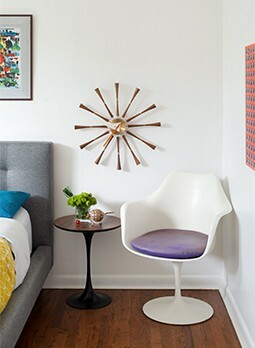 One of the most striking features added to the home is the divider for the Master Bedroom. 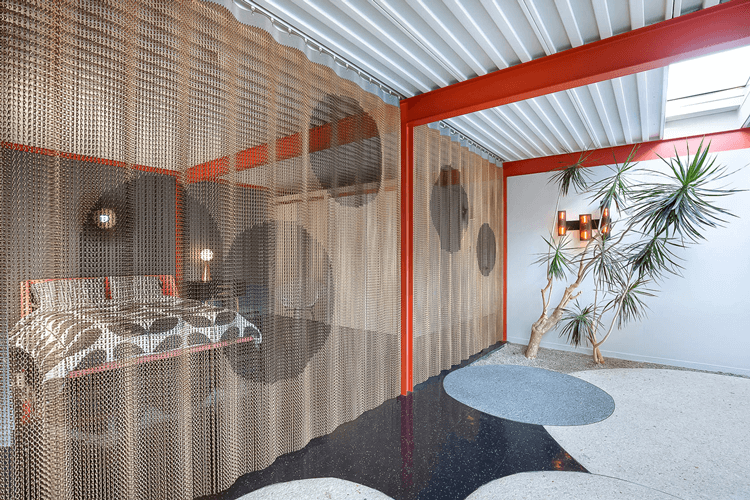 Custom made, the hanging divider’s dark and light copper links combine to create circular patterns. Rather than a traditional curtain that would have given more privacy, Marty opted for the intriguing mesh hanger for a fresh take on separating rooms. “Marty really wanted to have a discovery feeling for that bedroom,” Lucille remembers. Custom artwork from Modern Retrograde echoes the bold hues in the office. Lucille paired the vintage typewriter with modern furniture. 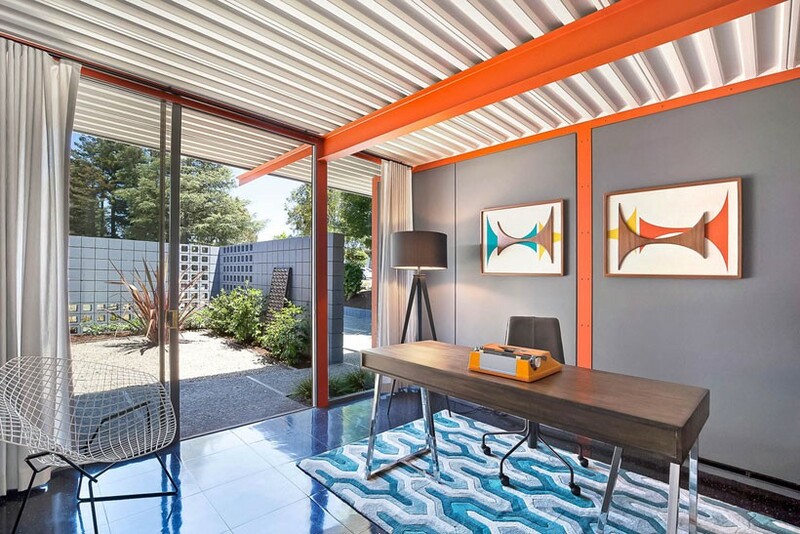 Beams were restored to their original vibrant color throughout the home, including the extra bedroom, currently being used as an office area. “I wanted it to be functional but at the same time, inviting… It was more of a fun space than just an office,” says Lucille. The orange from the beams is accented throughout the office, and custom artwork was created specifically for the room’s bold color scheme. The pool and coping were restored along with the aggregate concrete by JC Miller of Vallier Designs. The pool area and the pool itself needed repair, so the team worked with JC Miller—a landscape architect with Vallier Designs—to restore the outdoor space. Looking at original plans, JC carefully redid the pool and surrounding area. “The pool looks exactly like the original, including the concrete,” states Lucille. JC also beautifully recreated the landscaping to its original scheme. “All those rows of grasses, that was actually the original plan for it,” Lucille continues. 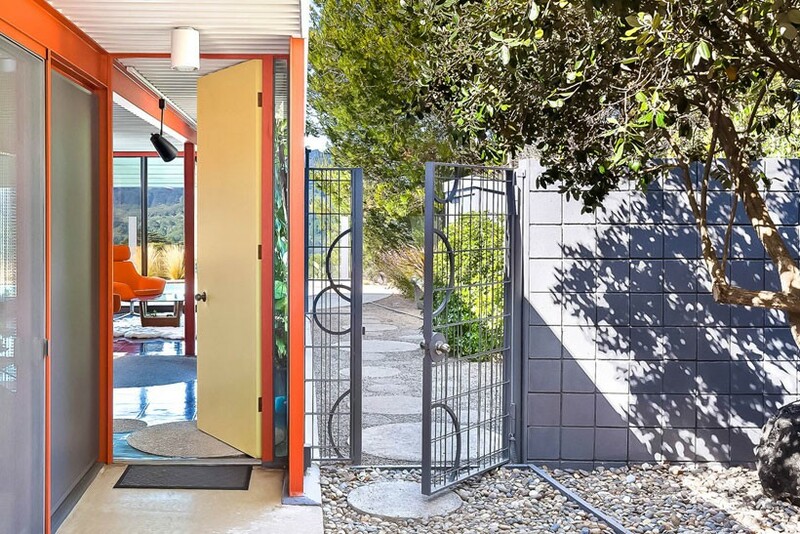 Working with JC Miller to find a design, the team added a gated door to the walkway. “Because of safety code, we needed to install gates at both sides of the house. 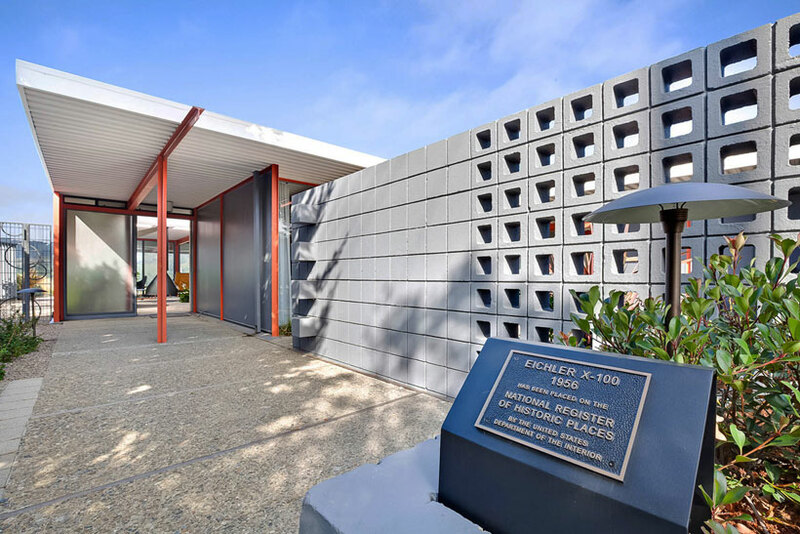 JC’s gate design was brilliant—very lightweight, open look incorporating the repeating Eichler X-100 circular themes (like the interior floors) into its design,” Marty explains. A previous owner had installed fences near the front courtyard and converted the carport to a garage by adding a door. 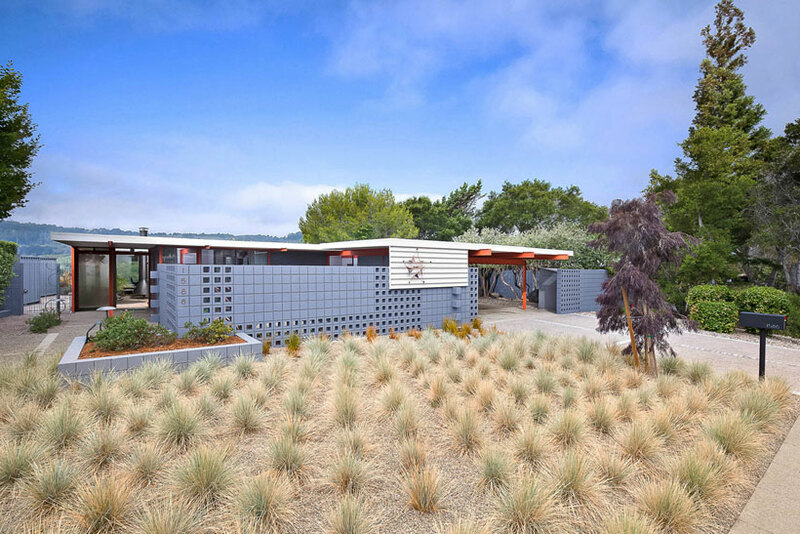 Marty and his team restored the original footprint by removing the fences and garage door, which reestablished a clear path from carport through the courtyard. For a finishing touch, they restored the copper and glass star sculpture on the front of the house. Originally olive-brown, the exterior of the home was painted a warm grey. The color continues along the south-facing wall that connects to the interior for a seamless transition. “I always considered the 1950s X-100 a blend of mystery, sophistication, and magic. I think it’s back—grounded perhaps by the gray walls and even the black floor tile,” says Marty. The home is now on the National Register of Historic places and open for tours! The home was placed on the National Register of Historic Places since 2016 and has been open for tours since 2017.